We’d love your help. Let us know what’s wrong with this preview of Undaunted by Kat Falls. Acclaimed author Kat Falls returns for another breathless, genre-bending adventure. First love is the most dangerous game in this fast-paced adventure perfect for fans of Marie Lu, Veronica Rossi, and Sarah J. Maas. Lane Everson barely survived her first journey to the Feral Zone. The forbidden, overgrown landscape east of the Mississippi River was abandoned years ago when Acclaimed author Kat Falls returns for another breathless, genre-bending adventure. Lane Everson barely survived her first journey to the Feral Zone. The forbidden, overgrown landscape east of the Mississippi River was abandoned years ago when a virus spread through the population, bringing civilization to its knees. But Lane has crossed the quarantine line, and she knows the truth. There are survivors on the other side of the wall - people who were not killed by the virus, but changed by it, their bodies warped to display a variety of animal traits. In the most severe cases, their minds are warped as well, leaving them barely human. To ask other readers questions about Undaunted, please sign up. WHEN IS THIS COMING OUT?!?!?!?! Hurry Up and Release It!!! Update: We have a title! And a cover! AND a synopsis!! Well, I don't know about you, but I LOVED Inhuman and I really don't know how I am supposed to wait for this next one. I think I might dieeeeeeeeeee. I need me some Rafe! I can honestly say that I am in love with the first one. I finished it about 2 minutes ago, and I'm practically bawling that this one isn't out yet. (I really am crying...) Rafe <3 I just love him so much! Usually I don't like all the characters in a book, but I actually did in the first one. I read the first book when it came out in 2013. ARE WE EVER GETTING THIS SEQUEL?!? IT HAS LITERALLY BEEN YEARS AND THE SEQUEL WAS SUPPOSED TO BE OUT IN 2016. Ughhhhh. If I have to transfer this book to my 2019 releases shelf....... I may actually lose my mind, because I've been transferring it to every "yearly" shelf since 2014. I thought Inhuman promised the next book would be out fall 2014... It's fall; still not out. It doesn't even have a release date yet. Or a cover! *Sign* I don't know how much longer I can wait for this book. Seriously, what is going on? When is this book going to come out! Kat Falls if you're reading this can you please (with a cherry on top) explain what's going on with Undaunted? I desperately want to read this, I'm glad I didn't read it in 2013 because I might have died from anticipation. 4 YEARS LATER I FINALLY HAVE THIS!! I've just casually been waiting for this book to come out for almost two years and it's at the point where I barely even remember what happened in the first book. The publication keeps getting pushed further back but I NEED IT NOWWWWWWWWW. Ugh! I want. I need ..I'm dying to read this! Why is it taking so long?? Eek!!! I am really excited for the second book to come out. I loved Inhuman and it was different than majority of the books I read! I cannot wait until it comes out. I loved the first Book it was quite different from a lot of other books I have read thus far, that's for sure! I am looking very forward to this upcoming book! It's been five long years since I was first pulled into Lane, Everson, and Rafe's adventures in the Feral zone in Inhuman. What started out as a fairly average book ended with quite the bang. The characters were enjoyable, the action compelling, and the book left me with a host of moral issues to think about. An extra bonus? There was little to no bad language. Plus, it's not often that I find myself almost equally happy with both sides of a love triangle. I loved both Rafe and Everson - althoug It's been five long years since I was first pulled into Lane, Everson, and Rafe's adventures in the Feral zone in Inhuman. What started out as a fairly average book ended with quite the bang. The characters were enjoyable, the action compelling, and the book left me with a host of moral issues to think about. An extra bonus? There was little to no bad language. Plus, it's not often that I find myself almost equally happy with both sides of a love triangle. I loved both Rafe and Everson - although for vastly different reasons. Given how long I waited for this book, it's not a surprise that I gobbled it up in the space of a day. I was desperate to know how my beloved characters' stories ended, and for the most part, I wasn't disappointed. I don't think the plot in this installment was quite as strong as the first - but then again, it's hard to match the pulse-pounding intensity of a deranged tiger-man who rips people's hearts out and eats them (just saying) - although it got the job done. I, personally, would have also enjoyed a bit more action on the romantic side of things (view spoiler)[although I understand the tricky situation Rafe and Lane were in what with Rafe being infected and all (hide spoiler)], but that wasn't a deal-breaker either. Ms. Falls does a great job of exploring the moral dilemmas inherent in Lane's world. Where is the line between human and inhuman, and does society have a right to strip someone's rights just because they don't meet the legal definition of human? Is it ever okay to test something on someone against their will, even if it might cure them or help the greater good? As in the first book, Undaunted is chock full of creatively imagined manimals and other animal hybrids. And the snark. Oh, the wonderful, ball-busting, glorious strong-woman snark. The lionesses - who we saw briefly in the first book - came back with a vengeance and they were amazing from start to finish. And the twist with (view spoiler)[Everson and Mahari? (hide spoiler)]. Yes, yes, 100 times YES. I was totally in for those fireworks. And we met so many more loveable characters. The orphans. The manimals at Camp Echo. Douchebag Rafe even made a reappearance (and he was as fun as always), although I was happy to see Lane knew enough this time around to call him on his crap. After years of waiting, we finally got it. I hope that most people hadn’t given up on waiting for, or forgotten, about Undaunted. 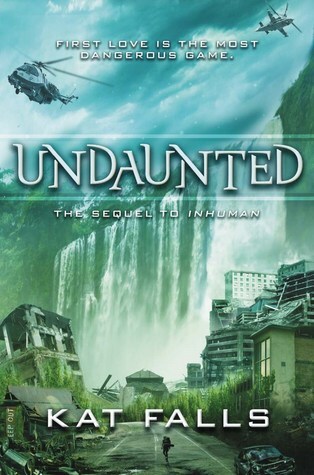 I just finished reading it and I thought Undaunted was a good way to end this story. sis where did this book go??? WHERE IS THE FREAKING BOOK?! IT KEEPS SAYING THAT IT CAME OUT IN APRIL 2016 BUT I CAN'T FIND IT ANYWHERE! When oh When Kat Falls? I am so far past ready to read this second book. And reread the first book. Loved the first book!!!! Just can't wait for the second!! A release date would be nice though!!! I loved the first book and I CANT wait for this to come out! It is many years in the future, and the nation is divided. The Titan Corporation, a company with immense power, created a virus by accident and released it upon the entire East Coast of the United States. The company quickly created a wall dubbed the Titan Wall and informed the world that everyone within the Zone was dead. However, a teenage girl named Lane discovers this is not the case. The people on the other side are very much alive but changed. Rather than kill, the virus changed human DNA to that of an animal, creating half breed humans with super strength, speed, senses, and more. The virus works slowly until it finally reaches the brain and makes its victim fully feral, wild beyond repair. Lane ventures into the “Feral Zone” and records videos of everything she witnesses. She decides to publish the footage to inform the world of what really happened. In addition, she has her own private agenda. Her friend and first love, Rafe, was infected and she has promised to put him down if he becomes wild. She fears she might have to follow through on her promise. I gave this book 5 stars because it is well written and fresh, with original ideas and topics not contained in other books. In this dystopian novel, the author achieves a perfect balance of comedy, action, and drama that would appeal to all audiences. Due to some romantic themes, although nothing sexual, as well as frequent swearing, I would recommend this book to middle school aged children or older. I got this book much earlier than the publication date from the public library. I didn’t even read the first book when I picked up Undaunted. I loved it. I was completely able to understand the story even without reading Inhuman. Of course there were a few blanks at first but as you kept going, the story made much more sense. Overall, this was an amazing read. I can’t wait to backtrack and read Inhuman and reread this book when the final copy comes out in March! This review has been hidden because it contains spoilers. To view it, click here. Thanks to the @kidlitexchange network for the review copy of this book - all opinions are my own. Thank you @scholasticinc for sharing this copy of Undaunted, set to release 3/26/2019! The sequel to Inhuman is finally here...and it did not disappoint (Inhuman spoilers in review if have not read). Lane heads back to the Feral Zone in search of Rafe who was infected with lion. Scientists are working on the cure but they need the last feral strand - lion - and Rafe is not going to give it up willing Thanks to the @kidlitexchange network for the review copy of this book - all opinions are my own. Lane heads back to the Feral Zone in search of Rafe who was infected with lion. Scientists are working on the cure but they need the last feral strand - lion - and Rafe is not going to give it up willingly. Everson runs away with Lane and the lionesses deep into the unprotected forest within the zone. There, they encounter a feral Komodo dragon hungry for blood, communities who shoot those infected on-site, and yet other communities where humans and those infected live together. Can Lane convince Rafe to give a blood sample? Who can the group trust? How can they help get the word out to the East that the Feral Zone may not be as scary as advertised? Lane, Everson & Rafe are all back for the conclusion of Inhuman. A cure has been found keep the manimals from turning feral. Can the three musketeers get the word out, save the manimals and keep themselves alive or will the Titan corporation move into position to rule the world. This was a fun and exciting adventure that never let you down. I have enjoyed all of Kat Falls books. I look forward to the next one. Didn't realize this was book two in a series until a couple of chapters in. Was vaguely considering reading the first book, but the Dystopian fad has died down a bit, this was a more on the YA side, and other books in my collection dealing with human/animal mutants just don't attract readers. I will pass, but if you have an insatiable demand for Dystopian novels, this had its moments.